The VIA VB7009 Mini-ITX mainboard is a compact embedded board designed specifically for POS and kiosk applications. With a wide variety of CPU choices ranging from a fanless 1.0GHz VIA C7 to more powerful options of either a 1.6GHz VIA C7-D or 1.2GHz dual core VIA Nano X2 processor, the VIA VB7009 provides superior flexibility to match your embedded computing needs. The VIA VB7009 features the VIA VX900 MSP which includes the VIA ChromotionHD 2.0 video processor for advanced filtering and cutting edge post-processing for MPEG-2, VC-1, WMV9 and H.264 video formats delivering rich digital media performance. 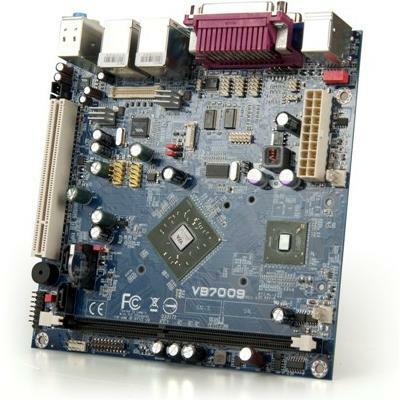 The VIA VB7009 supports up to 4GB of DDR3 system memory and delivers native support for SATA II storage devices. High-bandwidth connectivity is enabled through on-board dual RJ45 ports supporting Gigabit networking. Four USB 2.0 ports are included, with four more available through onboard pin headers. The VIA VB7009 is fully compatible with Microsoft and a wide range of Linux operating systems and is available in a variety of configurations.